Danny Holmes has been working at Princess Elizabeth Public School as a Lunchroom and Yard Supervisor since November. Danny’s responsibilities include monitoring and assisting the students with nutrition breaks, playtime and preparing the students to go outside for recess. Outside in the yard, Danny supervises the children to make sure they play safely and helps where needed. 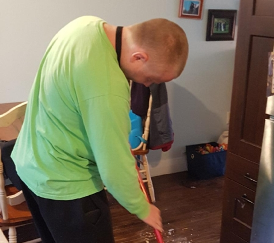 Danny also works diligently cleaning two houses a week for two community members and is also an entrepreneur running his own business snow shovelling and grass cutting. Danny has been with Employment Plus since September and frequently pops in with a smile to say hi before beginning his shifts. Danny enjoys spending time with his family, friends and visiting his brother (Joey), who is also with Community Living and lives in Orangeville. He participates in Options when he can and likes to swim, listen to music and participate in other activities. Danny attended and successfully completed Employment Services pre- employment training (LEAF) where he gained valuable employment skills which includes conflict resolution, professionalism, financial literacy, work ethic and other tools to be successful in the workplace. If you’d be interested in hiring Danny for your yard or snow maintenance give him a call.